Home :: Fiber and Ethernet :: Mikrotik GPON ONU module - New! 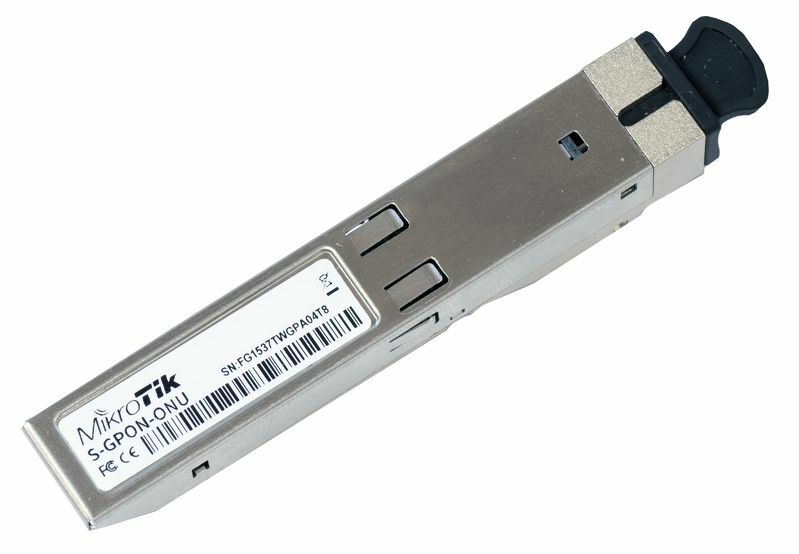 Mikrotik GPON ONU module - New! The Mikrotik GPON module allows any RouterBOARD device to be used for Fiber to Home installations without any special modems or software. A plug and play solution means you simply plug it into your device, and no special configuration is needed. It is supported by all our SFP products, with any RouterOS version - all configuration will be done on the ISP side. The GPON ONU integrates GPON OMCI Stack and is fully compliant with ITU-T G.984 standards. The ONU is in a standardized MSA SFP form-factor and is designed to simply plug into a standard SFP port in your router. The product provides a pluggable GPON ONU interface for networking equipment with an uplink SFP receptacle enabling these devices to be deployed in GPON networks for FTTx, business services, and wireless backhaul applications. NOTE: Mikrotik has created an SFP compatibility table to help clarify compatibility between MikroTik made SFP modules and MikroTik RouterBOARD hardware. 1m SMA male to SMA male cable OEM Mikrotik Rack Mount Kit for RB4011 Router - black finish with screws Mikrotik PL6411-2nD 802.11b/g/n WiFi AP with a single Ethernet port and capability to connect to other PWR-LINE devices - New! Mikrotik ACGPSA is standalone active GPS antenna, that works in 1575.4 MHz spectrum - New! Mikrotik RouterBoard CCR1036-8G-2S+EM Extreme Performance Cloud Core Router with 8-10/100/1000 ethernet ports, 2 SFP+ ports and RouterOS Level 6 license - New! Mikrotik SFP+ direct attach Active Optics cable, 5m - New!